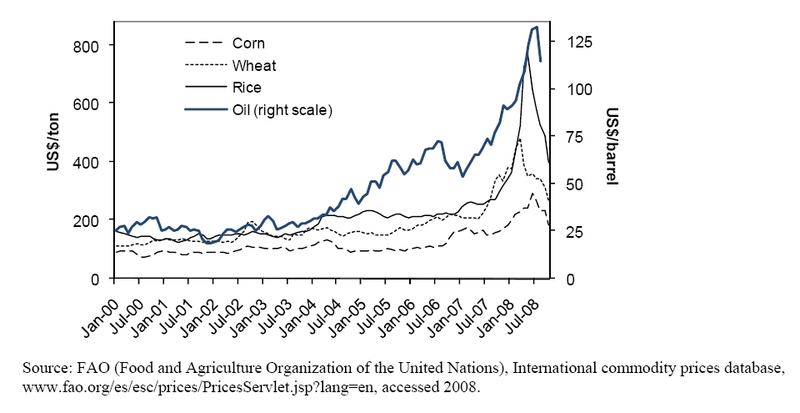 The 2007–08 international food price crisis caused hardship on a number of fronts. The steep rise in food prices led to economic difficulties for the poor and generated political turmoil in many countries. The crisis could also result in long-term, irreversible nutritional damage, especially among children. There is a global interest in preventing such events from recurring. In addition to the supply and demand fundamentals there is substantial evidence that the crisis was made worse by the malfunctioning of world grain markets and by response of countries to protect their own internal consumption. These reactions begin as consequences, not causes, of the price crisis, but they exacerbate the crisis and increase the risks posed by high prices. By creating a positive feedback loop with high food prices, they take on a life of their own, increasing the prices and their volatility even more, with adverse consequences for the poor and for long-term incentives for agricultural production. Because they impede the free flow of food to where it is most needed and the free flow of price signals to farmers, these market failures impose enormous efficiency losses on the global food system, hitting the poorest countries hardest. This paper tries to understand what was behind the price spike and to propose some alternative policy solutions that could prevent this from happening in the future. Changes in supply and demand fundamentals cannot fully explain the price spike in the first six months of 2008. As a result, a “price spike” above what is explainable by fundamentals occurred during the first six months of 2008 as depicted in Figure 1. There are two major explanations behind this price spike. First, ad hoc trade policy interventions, such as export bans or high export tariffs or high import subsidies were partly triggered by the price crisis and exacerbated the crisis symptoms. As of April 2008, 15 countries[Argentina, Bangladesh, Bolivia, Cambodia, China, Egypt, Ethiopia, India, Kazakhstan, Malaysia, Pakistan, Russia, Tanzania, Vietnam, and Zambia] including major producers imposed export restrictions on agricultural commodities, thereby narrowing the global market. For instance, China banned rice and maize exports, while India banned exports of rice and pulses. Argentina raised export taxes on soybeans, maize, wheat and beef; and Ethiopia and Tanzania banned exports of major cereals. Export bans ensured greater food availability domestically, but they also reduced the market for agricultural products, increased price volatility, and worsened market conditions for import-dependent countries. In addition, export bans stimulate the formation of cartels, undermine trust in trade, and encourage protectionism. Among the countries imposing new or additional price controls are Benin, China, Malaysia, and Senegal. Other nations, however, have contributed to the expansion of the global food demand. Some net-food importing developing countries reduced import barriers—in principle a welcome move toward more open trade, but one that added to the upward pressure on prices. Morocco cut tariffs on wheat imports from 130 to 2.5%; Nigeria slashed duties on rice imports from 100 to 2.7%; Peru removed import taxes on wheat and maize; and Senegal waived duties on cereal imports. Policy responses such as export bans or high export tariffs may reduce risks of food shortages in the short-term for the respective country, but they are likely to backfire by making the international market smaller and more volatile. At the country level, price controls reduce farmers’ incentives to produce more food and divert resources away from those who need them most. Export restrictions or policy failures have harmful effects on import-dependent trading partners. For example, export restrictions on rice in India affect Bangladeshi consumers adversely and also dampen the incentives for rice farmers in India to invest in agriculture, which is a long-term driver of growth. IFPRI simulations with the MIRAGE global trade model had shown that these trade restrictions can explain as much as 30%of the increase in prices in the first six months of 2008. These IFPRI modeling results from the MIRAGE model should be taken as a conservative estimate. IFPRI models neither factor in speculation over and above market fundamentals, nor the increased price impacts of any quantity change in the much more narrow international market. Secondly, the flow of speculative capital from financial investors into agricultural commodity markets was significant. From May 2007 to May 2008, the volume of globally traded grain futures and options increased substantially (Table 2). Another indicator of speculative activity—the ratio of the monthly volume of futures trading to open interest—also increased substantially. Open interest describes the total number of futures contracts of a given commodity that have not yet been offset by an opposite futures contract or fulfilled by delivery of the commodity. A speculator taking opposite positions in the market within days or weeks will generate an increase in monthly registered volumes but little change in monthly open interest. Therefore changes in this ratio should capture changes in speculative activity. In 2008, soybean and rice ratios of futures to open interest were increasing at 27% and 19% respectively, as wheat ratios continued to grow at 19% and maize ratios declined slightly. In contrast, in 2005 and 2006 at least three commodities’ ratios were declining on average. We conducted several statistical tests to determine the role of speculative activity in commodity prices. The results suggest that speculation might have been influential. Our analysis tested to what extent the selected indicators for speculative activity can help forecast spot price movements (Robles, Torero, and von Braun, 2009). The Granger causality test—which determines whether past movements in one variable can help explain current movements in another one—was applied to each agricultural commodity (Table 3). The results show that the size of trading activity in futures contracts—when measured by volume or open interest separately—do not show evidence of affecting commodity prices. The ratio of monthly volume to open interest in futures contracts, however, has an influence in forecasting price movements for wheat and rice. In other words, past changes in this ratio help to forecast future changes in the prices of wheat and rice. In the case of rice, the ratio of noncommercial long positions to total long positions also has an effect on prices. When the same ratio for short positions was analyzed, there was additional evidence that speculation affects prices, with significant results in the soybean market. Finally, when we tested whether net positions of index traders (since 2006 the Commodity Futures Trading Commission provides information on futures and options trading by a new category of traders in selected agricultural markets, the so- called “index traders”) since January 2006 have any influence on commodity prices, we found positive evidence in the case of maize. There is evidence, therefore, that speculative activity partly explains the price spike since January 2008. Appropriate global institutional arrangements for preventing this kind of market failure are needed. The price spike episode clearly highlights the need to modify the institutional architecture of international financial and agricultural markets to address their effects on the livelihoods of the poor. On the export bans there should be no illusion: this problem cannot be addressed country by country, as governments have the legitimate interest to care for their citizens first. The new wave of export restrictions requires urgent international attention. It should not be added on top of the WTO Doha Round. Instead, it should be addressed by an ad hoc forum of a consortium of global players with a code of conduct and mutual trust building in political negotiations. At least, export trade for humanitarian purposes should be re-opened now. On speculation, there are two traditional options. The first is to build up a significant physical, public, globally managed grain reserve. In a globalized world, however, the scale of reserves required under this option would make storage costs excessive. A physical reserve is thus not appropriate as a major global initiative, but only as a minor one to address the need for smooth emergency operations. The second option is to change regulation of commodity exchanges to limit the volume of speculation versus hedging, to make delivery on contracts or portions of contracts compulsory, and to impose capital deposit requirements when each futures transaction is made. Difficulties could arise, however, in walking a line between ineffective regulations and overzealous ones. Market regulation also raises political economy concerns: regulatory measures could benefit relatively small groups, elites may capture the regulatory agency, international regulatory agreements might not be completed, and countries may lack the institutional capacity to implement and enforce the regulatory measures. Although some improvement in regulation is called for, regulating commodity exchanges in harmony across the globe appears too complex a collective action problem given very different country circumstances. The two global collective actions we propose—a small, independent physical emergency reserve to minimize the risk of lack of access to the minimum level of grains required for humanitarian assistance, and a virtual reserve and intervention mechanism backed up by a financial fund—would avoid these problems while ensuring that the world can respond to emergency needs for food and prevent extreme price bubbles. A modest emergency reserve of around 300,000–500,000 metric tons of basic grains—about 5% of the current food aid flows of 6.7 million wheat-equivalent metric tons—would be supplied by the main grain-producing countries and funded by a group of countries participating in the scheme (the G8+5 plus some other major grain-exporting countries). This decentralized reserve would be located at strategic points near or in major developing-country regions, using existing national storage facilities. The reserve, to be used exclusively for emergency response and humanitarian assistance, would be managed by the World Food Program (WFP). The WFP would have access to the grain at precrisis market prices to reduce the need for short-term ad hoc fundraising. To cover the cost of restoring the reserve to its initial level (that is, the difference between the postcrisis price and the precrisis price times the quantity of reserves used by WFP), an emergency fund should be created and its level maintained by the participating countries. The fund should be accompanied by a financing facility that the WFP could draw upon as needed to cope with potentially increased transport costs, as experienced in the 2008 crisis. This arrangement could also be defined under a newly designed Food Aid Convention. The virtual reserve would be implemented as a coordinated commitment by the member countries (the G8+5 plus some other major grain-exporting countries). Each country would commit to supplying funds, if needed, for intervention in the futures market. The fund would normally consist not of actual budget expenditures, but of promissory, or virtual, financing by the members. These funds would be drawn upon by the high-level technical commission only when needed for intervention in the futures market (much previous evidence has shown a link between futures and spot markets). The intervention mechanism will be two-pronged. First, and perhaps most important, the global intelligence unit will announce price forecasts and specify the price band. This announcement will be a signal—or a threat—to speculators that intervention is likely if futures prices exceed the defined upper limit of the price band. Moreover, the announcement will specify a confidence interval for the upper limit to increase the risk for potential speculators. Second, if, despite the signal, there is evidence of an emerging price bubble, an autonomous technical commission will then decide whether to intervene in the futures market. This intervention would consist of executing a number of progressive short sales (that is, selling a firm promise—a futures contract—to deliver the commodity at a later date at the specified price) over a specific period of time in futures markets at market prices at a variety of different future positions until futures prices and spot prices decline to levels within the estimated price bands. This increase in the supply of short sales will reduce spot prices and should make speculators move out of the market—in other words, a backwardation will be created (the situation in which, and the amount by which, the price of a commodity for future delivery is lower than the spot price or a far future delivery price is lower than a nearer future delivery price). Moving speculators out of the market will minimize the potential second-round effects of this intervention given that spot prices will return to being consistent with fundamentals, and therefore the lower spot prices should not result in the accelerated use of available supplies. All futures contracts are ultimately settled either through liquidation by offsetting purchases or sales (the vast majority of agricultural futures contracts are settled this way) or through delivery of the actual physical commodity. The virtual fund will thus come into play only if there is a need to realize the futures sales, in which case the fund will be used to obtain the necessary grain supply to comply and calm the markets. Usually, this action would not be necessary and the whole operation would stay virtual. The innovative concept behind the virtual reserve is the signal that it gives to markets, including speculators. Its presence alone is likely to divert speculators from entering this market. Nonetheless, the commission must be ready to trade grain when necessary and to assume the costs if in the future it must buy back contracts at a higher price than it sold them for. Preliminary estimates show that for the virtual reserve to be a credible signal, the fund should be US$12–20 billion. A fund of this size might cover 30 to 50% of normal grain trade volume. Determining the exact size of this fund will require further analysis, however, because commodity futures markets allow for high levels of leverage. The proposals made here are designed not to stabilize prices generally, but to prevent damaging price spikes. The proposed actions will entail costs, but the modest costs of the required organizational elements must be balanced against the benefits of more effective international financial architecture. These benefits will include prevention of economic hardship, improved market efficiency, stronger incentives for long-term investment in agriculture, and prevention of political instability. The excess price surges caused by speculation and possible hoarding could have severe effects on confidence in global grain markets, thereby hampering the market’s performance in responding to fundamental changes in supply, demand, and costs of production. More important, they could result in unreasonable or unwanted price fluctuations that can harm the poor and result in long-term, irreversible nutritional damage, especially among children. Appropriate global institutional arrangements for preventing these market failures are missing. A global solution that prevents excessive speculation in food markets may be costly, but given the losses created by food price crises like the one in 2007–08, it will still have large positive net returns. It is clear that the incentives for speculation in food commodities could be reduced by (1) changing regulatory frameworks to limit the volume of speculation versus hedging, (2) making delivery on contracts or portions of contracts compulsory, (3) imposing capital deposit requirements when each futures transaction is made, or all three. These regulatory measures could be implemented case by case or as a platform through an international "alliance of commodity exchanges". Therefore there is a clear need (a) to undertake a policy debate about exchange regulation and the role of speculative traders and (b) that debate is very likely to include the issue of international harmonization. A new global institutional arrangement encompassing a “virtual reserve” could be an alternative solution (see for implementation details von Braun and Torero, 2009). This virtual reserve would consist of a coordinated commitment by member countries (the Group of Eight Plus Five plus some other major grain-exporting countries such as Argentina, Thailand, and Vietnam). Each country would commit to supplying funds, if needed, for intervention in the futures market. The innovative concept behind the virtual reserve is the signal that it would give to markets, including speculators. Although its presence alone would likely divert speculators from entering this market, the virtual reserve must be ready to trade grain when necessary. This concept could provide the kind of global collective action that is needed to facilitate well-functioning grain markets and to reduce the harm that can result from excessive price spikes. There are two major concerns that need to be taken into account. The first is the importance of the global intelligence unit and their challenging role in price forecasting. To be a credible basis for market intervention, price forecasts must contain some new knowledge, widely regarded as credible when released, that is not already reflected in the structure of market prices. This new knowledge is the combination of both the fundamentals component (i.e. supply and demand factors) and a midterm/long-term financial model in which stochastic factors are captured. Secondly, a potential caveat of the proposed virtual reserve concept is that it requires cross-country coordinated institutional design which has the risk that one of the country members won’t comply with the jointly agreed upon commitment. For example, one of the country members doesn’t comply with providing the resources for the “emergency reserve” or with supplying the necessary financial resources for the “virtual reserve”. To minimize this caveat, clear rules for the participating countries should be developed and dispute resolution mechanisms should be in place. Finally, to evaluate these actions, a comprehensive cost/benefit assessment must go beyond agricultural markets (and must include security and poverty considerations). The system should be exposed to evaluation of effectiveness, and to close monitoring while being implemented. Bakary, S. (2008, April 17). The New Face of Hunger. The Economist. Brahmbhatt, M., and Christiaensen, L. (2008). Rising Food Prices in East Asia: Challenges and Policy Options. The World Bank. Available online: http://siteresources.worldbank.org/EASTASIAPACIFICEXT/Resources/EA_Rising_Food_Prices050508.pdf. Calvo, G. (2008, June 20). Exploding Commodity Prices, Lax Monetary Policy, and Sovereign Wealth Funds. VoxEU. IMF Fiscal Affairs, P. D. a. R. a. R. D. Ter–Minassian, T., M. Allen, and S. Johnson, ed. (2008). Food and Fuel Prices: Recent Developments, Macroeconomic Impact, and Policy Responses. Lipsky, J. (2008). Commodity Prices and Global Inflation, Remarks At the Council on Foreign Relations, New York City, May 8, 2008. Rojas–Suarez, L. (2008). The Right Response in Latin America to Oil and Food Price Pressures: Fight Inflation Now! Center For Global Development Essay. Washington DC. Rosegrant, Mark W., Zhu T., Msangi, S., Sulser, T. (2008). The Impact of Biofuel Production on World Cereal Prices, International Food Policy Research Institute, Washington, D.C., unpublished paper quoted with permission July 2008. Sommer, M., and Gilbert, C. (2006). The Boom in Nonfuel Commodity Prices: Can It Last? In World Economic Outlook 35.
von Braun, J. (2008c). Rising Food Prices: What Should Be Done? (Policy Brief, April 2008).Washington, DC: International Food Policy Research Institute. Available online: http://www.ifpri.org/pubs/bp/bp001.asp. World Agricultural Outlook Board. (2008). World Agricultural Supply and Demand Estimates. WASDE–460. Income growth, population growth, and urbanization Cereal demand has been growing at 2–3 percent per year, thanks to rising incomes in China, India, and, more recently, Sub-Saharan Africa. Meanwhile, yield growth in these cereals has declined from 3 percent in the 1970s to 1–2 percent in the 1990s. This resulted in a significant reduction of cereal reserves to less than 400 million tons in 2007 from 700 million tons in 2000. Ethanol/Biofuels With oil prices at an all-time high of more than US$120 a barrel in May 2008 and with the United States and the European Union subsidizing agriculture-based energy, farmers have shifted their cultivation toward crops for biofuels. Impacts vary from Lipsky (2008) estimating that the increased demand for biofuels accounted for 70 percent of the increase in maize prices and 40 percent of the increase in soybean prices to Rosegrant et al. (2008) estimates of long-term impact on weighted cereal prices of the acceleration in biofuel production from 2000 to 2007 to be 30 percent in real terms. Increased oil/fertilizer prices Oil prices increased significantly. Affected directly transportation costs and indirectly price of fertilizers (See IMF Fiscal Affairs, 2008). Low R&D investments in agriculture The neglect of agriculture in public investment, research, and service policies during the past decade has undermined its key role for economic growth. As a result, agriculture productivity growth has declined and is too low. Droughts/Climate change Occurring in large grain-producing nations, droughts and climate change have lowered worldwide production. More volatile weather patterns related to climate change increased. Dollar devaluation The indicator prices of most commodities are quoted in U.S .dollars, and the dollar went through a substantial depreciation. Even though when adjusted for inflation and the dollar’s decline (by reporting in Euros, for example), food price increases were smaller but still dramatic. Large excess of liquidity in non-G7 countries Large excess liquidity in several non-G7 countries, nourished by the low interest rates set by G7 central banks. Commodity prices are the result of portfolio shifts against liquid assets by sovereign investors, sovereign wealth funds, partly triggered by lax monetary policy, especially in the United States (For details, see Calvo 2008 and Rojas Suarez 2008). Source: Chicago Board of Trade 2008. Notes: + indicates evidence of causality. * indicates that these data combine futures and options positions; data since January 2006 are available. Joachim von Braun (j.vonbraun@cgiar.org) is Director General of the International Food Policy Research Institute (IFPRI), and Maximo Torero (m.torero@cgiar.org) is Director, Markets, Trade and Institutions Division, International Food Policy Research Institute (IFPRI), Washington, D.C.